UNIVERSITY HEIGHTS, Ohio -- No. 7 ranked Mount Union had a record setting day in a 41-6 rout of John Carroll in an Ohio Athletic Conference dual Saturday at the DeCarlo Varsity Center. 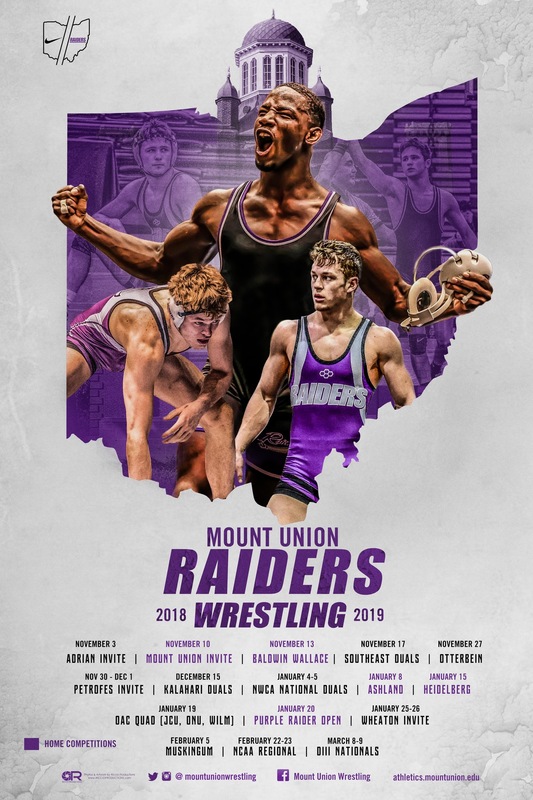 The Purple Raiders (15-3) have now beaten the Blue Streaks three straight years with 11 wins in the the teams last 12 meetings while the 41 points scored by Mount Union is the most against John Carroll in 56 dual matches all-time dating back to 1965. Mount Union won nine of the 10 weight classes and scored bonus points in six of its nine wins. John Carroll led 6-0 after Andrew Perelka got a pin at 125 pounds but the Raiders got back into the match at 133 pounds when No. 2 ranked sophomore Jordin James (Bedford) posted a technical fall then Mount Union took an 8-6 lead after freshman David Massey (Cuyahoga Falls / Woodridge) got a 5-1 decision at 141 pounds. The turning point of the match came at 149 pounds when sophomore Luke Hernandez (Nashport / Tri-Valley) had a first period pin of John Carroll senior Jarrad Lasko which at the time gave Mount Union a 14-6 lead. The Raiders then got a technical fall from No. 10 ranked nationally sophomore Antwon Pugh (Fairlawn / Copley) at 157 pounds before fellow sophomore Michael McIntire (Wadsworth / Akron St. Vincent-St. Mary) posted a 7-0 shutout win at 165 pounds that made the team score 22-6. Mount Union then put the match the away with pins from junior Conner Homan (Loveland) at 174 and Landon Talbert (Salem / Crestview) at 197 on each side of a major decision from freshman Tyler Stepic (Brook Park / Lakewood St. Edward) at 184. Senior Nick Corvo (Medina / Highland) finished off the match with a 12-9 win at 285 pounds.